Henson was located on Henson Creek west of Lake City. In 1877 a toll road was completed over Engineer pass between Lake City and Silverton and Ouray. The town had a post office in 1883, but only for one year. Many buildings can still be seen standing from the road without trespassing. The only photograph I currently have is of the mill sitting below the road. 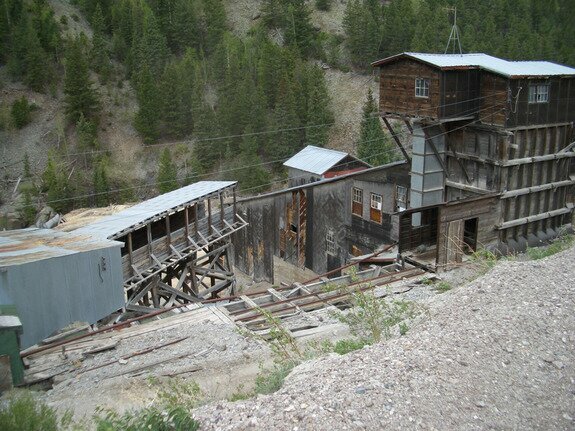 Like so many mining camps in Colorado's history, Henson was the location of a miner's strike. However, it was settled without Bloodshed even after the Governor ordered State Militia to the area. The mill at Henson. Henson Creek below. Date Taken: 2005:05:29 02:48:29 Want to use this image? See the More information tab.